Frequent travelers have one thing in common: debating whether to bring a small suitcase like a carry-on, or a larger one that will need to be checked in. Carry-on is fine, so long as what’s inside remains the same throughout your trip, but you and I both know, it is kind of hard and more often than not, being conservative results in us buying another luggage to keep the excess. This is a problem that has been around for ages and surprisingly, there aren’t any real solutions to meet modern, globetrotters’ needs, until now. 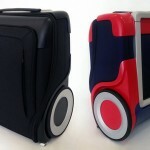 Meet Fugu Luggage. 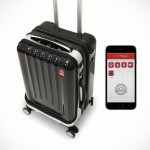 As its name implies, this travel suitcase is much like the marine counterpart it has taken name from: it is expandable. While it won’t blow up in size when provoke or senses danger, it can however, expand whenever you need the extra space and collapsed into to a handy, quick-getaway carry-on for short trips. As a carry-on it is fully compliant with maximum size allowable for carry-on for most airlines and as a check-in luggage it is also compliant with the maximum check-in size. 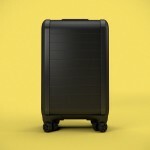 It measures 13.5″ x 21.5″ x 9″ with 40L of storage space in carry-on mode and can be quickly transformed into a large-size luggage that stands 27 inches tall, offering a whopping 120L of usable space. Fugu luggage uses air to inflate which it can do through one of the three ways: electric pump at a press of a button, using a regular air pump, and blowing it up through an external tube. For obviously, we will not do neither of the latter, but it is good to know there are backup systems in place. The folks behind Fugu did not stop there. They went ahead to include removable shelves within Fugu so your suitcase can also double as a storage unit, thus negating the need to unpack while keeping your belongings neat and tidy. Additionally, the Fugu’s expanded 120″ height makes it an ideal for use as a makeshift table for your laptop and even as a dresser. Just lift up the top, and you will find yourself a usable tabletop with around 290 square-inch. Other highlights include shock absorbent walls, waterproof construction, aluminum telescopic handle and omni wheels for true, freedom of movement. 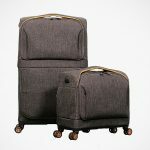 If you travel quite a bit and love the idea of an expandable luggage that looks awesome, then you can pre-order one off Fugu Luggage’s Kickstarter campaign for $219 and up, with shipping expected to kick off in August 2015. It will be quite a wait, but we will leave it to you to decide whether Fugu is the worthy investment. Keep going for the product pitch video.